Saturday, July 25th, St. James Anglican Church , 8107 S. Holmes Road, celebrates the 30th anniversary of its presence in Kansas City. Beginning at 10:00 am with a traditional Solemn Anglican High Mass, the festivity includes a celebration of Anglican Art and Music. William Perry, a UMKC PhD tenor student of vocal music, will cantor the Anglican chants. 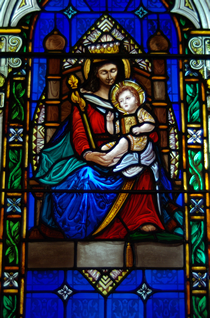 An exhibit of 10 classic European Style stained glass windows, masterfully crafted by Joy Stained Glass Studio of the Kansas City, will be unveiled. As one of the few artist in the nation of this ancient genre, artist Russell Joy will be available for questions. St. James Anglican Church Family, Kansas City welcomes you in the name of our Lord Jesus Christ! Glad you found us. 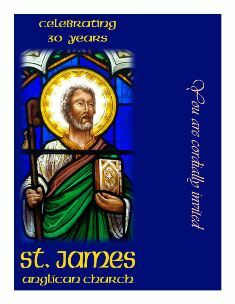 St. James is the cathedral parish of the Diocese of Holy Trinity & Great Plains of the Holy Catholic Church Anglican Rite. We stand in unbroken continuity of the Apostolic Faith and Order given by Jesus Christ in His Church. Our Faith is based on the Word of God found in Holy Scripture, as interperted by the undivided Church. We are part of the continuing church, that was necessitated because of the exigencies of change in the Episcopal church in the 1970's, to preserve the faith once delivered unto the saints in the Anglican Tradition. And hence the use of the 1928 Book of Common Prayer and the use of 1940 Hymnal to help in the liturgical worship. Here are some questions and answers that may help understand St. James. The following are frequently asked questions we get here at Saint James. Many of the answers are brief overviews. This is because many answers to questions (particularly theological ones) are more complex than what we could do justice to in such a small space. We hope that this information is both enjoyable and informative, and we look forward to seeing and talking with you soon. Is St. James an Episcopal Church? The answer to this question is both yes and no. As most of us know, the word “episcopal” is merely the adjectival form of the word “bishop.” This term was originally used to describe a church’s hierarchical structure, but the common use of this word today is usually employed to describe the Episcopal Church USA. We are an “episcopal” church in that we adhere to the ancient and Apostolic form of Church governance and polity. Also, we are an “Episcopal” Church in that we use the traditional Book of Common Prayer (the American 1928 edition), which is one of the single greatest literary contributions of the Anglican Church. We share a very similar heritage with the Episcopal Church USA; however, many innovations over the past few decades have made it a necessary matter of conscience for us to disassociate with that body. Though many of our friends, neighbors, and family members belong to this Church we are not members of the Episcopal Church USA. Is St. James Catholic or Evangelical? These are two words within the English lexicon that are sorely misunderstood by most people. This is due largely in part because of (believe it or not) World War II. It was at this time that the military began to issue what has come to be known as “Dog Tags.” These are the aluminum identification tags worn around the necks of all uniformed men and women of the American armed forces. On these “dog tags” are an individual’s name, branch of service, blood type, etc. Also included is the optional “religious preference.” During World War II there were but two options: Catholic or Protestant. The theory at this time was that if you were not Roman Catholic then you had to be Protestant. The word “Catholic” has its origins in the Greek language, but was adopted early on by the Church in the Latin speaking West. This word simply means “throughout the whole,” i.e., universal- "That which is accepted everywhere and by al" according to St. Vincent of Lerins. The East used the word “Orthodox” to describe themselves, and this simply means, “right thinking,” i.e., traditional. Up until 1054 AD the Catholic West and the Orthodox East were united as One Church (with the exception of a few temporary separations). Naturally, the Catholics and the Orthodox claimed to possess the truth over their disagreement that lead to the split. The Catholics maintained the Papacy, and the Orthodox settled matters of faith in councils attended by the Church’s bishops just as the Church had done prior to the schism. So, back to the original question, is St. James a Catholic or Evangelical Church? It is Catholic in the ancient and undivided understanding of the word. It is true that the Roman Catholic Church has a different understanding of the word “Catholic” today, but it is our firm belief that our use of the word “Catholic” is more accurate and more closely emulates those Christians that were first known as Catholics. We are Evangelical in that we, like all Christian peoples, seek the true Word of God. Thus, we must say that Saint James practices the Catholic Faith in its Anglican expression - Anglo Catholic. Why doesn’t St. James have any female clergy, or at least female acolytes and lay readers? Why is worship at Saint James so structured; why not something new and exciting like contemporary worship and praise music? The single most obvious problem with this question is that it assumes that worship at Saint James is boring. We believe that the parishioners here would disagree heartily with that assumption. It is true that worship is orderly; the music consists of traditional hymns and Anglican chant, all of which is very beautiful. Saint James, nonetheless, is a traditional parish. We believe, as the Church has for some time now that worship is not entertainment. While at worship we believe that we are truly in the presence of God, and as Scripture tells us: O, worship the Lord in the beauty of holiness; let the whole earth stand in awe of Him (Psalm 46: 9). Why would one want to clap hands, stomp feet, scream and shout, in the house of the Lord when we would not dream of behaving this way when invited to our neighbors house? The house of the Lord (the church) is a place where we can come to solemnly reflect inwardly on our very souls. It is a place where many people come to do this. We must give them, and most importantly God, the utmost respect. The Divine Liturgy (the order of the Church Service) is an orderly rite full of ceremony. This is how the Church has worshiped since the beginning. In each prayer and in each action in the liturgy we all learn something more about God. In the fact that our worship is structured, for example, we learn that God too is structured and orderly. God is not a god of chaos; He is the God of the universe who created the orderly laws of nature such as physics and chemistry. Our worship allows for us to come to a better understanding of God’s nature. When we can more fully understand this, then we know how to order our lives around His will. For this is how the Saints of God have lived their lives on earth—lives ordered around God’s will. This is ultimately the mission of the Church—to make saints of her members. Do you, at Saint James, pray to Saints? Here is another terrible misunderstanding by many people. The entire controversy surrounding this issue is grounded merely in semantics. In numerous plays by William Shakespeare and other authors of his era, the phrase, “I pray thee…” occurs very often. No divine praise is assumed in these instances, rather in contemporary language we would say something like, “I implore you” or something else to that effect. The assumption is that our members render divine praise to such people as the Blessed Virgin Mary, St. Francis, and other historical and heroic members of the Church. The reality is that these Saints are merely asked (or implored) for their prayers on our behalf. As Christians we all believe in the power of prayer. Exactly how quantifiable that prayer is we do not know, but we do know that it is powerful nonetheless. No Christian man or woman would be insulted when asked for his or her prayers. We pray for one another regularly. Then why is it that some become offended when we ask someone such as the Blessed Virgin Mary to pray for us? Is she not alive and well in the presence of God? We say unequivocally YES she is as are all of God’s saints. And, we have the Holy Hope that through the mercy of God we too will be with them one day. We at St. James hope that this literature was helpful to you. And, we always invite additional questions and comments. Please accept our humble invitation to come and worship with us. And, please feel free to contact us anytime should you have any needs for a priest. May God always bless you richly.